Visit Doolin Cave and explore the Burren landscape above-ground and under-ground. Doolin Cave is one of Europe’s most compelling cave attractions. It is a truly authentic experience. 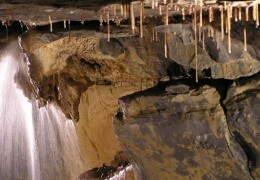 It is your only opportunity to see such a large free hanging stalactite anywhere in the world. From the moment you descend over 80ft into the first tunnel, with your guide, you will enter a world carved by water. Donning your hard hat, you will follow the rough-hewn route of the early explorers who first discovered the cave. When you enter the stunning, cathedral-like dome that houses the huge stalactite, you will be briefly plunged into a world of primitive darkness. Then, in a flash, you will be awed as the subtly-lit stalactite appears before you. And, far below, a magical stream carries to the hills outside, the water that carved the primeval world around you. Doolin Cave Farmland Nature Trail takes a looped walk, approximately 1km long around the cave setting. 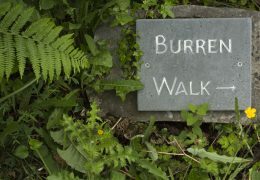 There is seating along the trail set amidst native Burren flora and wild flower meadows. There are also rare and miniature breeds of cattle, sheep, goats and chickens to watch and enjoy along the trail. Set in a picturesque valley surrounded by rolling farmland and Burren cliffs with a view to Ballinalacken Castle, it provides wonderful photo opportunities to visitors. 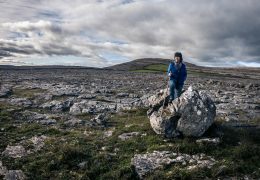 The trail is an ideal activity for families in the Burren. Doolin cave farmland nature trail is free to all cave visitors. The trail is a gentle stroll over approx 1km. Doolin Cave Café can provide picnics to enjoy out on the nature trail.